Europe in three volumes – its a hatrick – each of the three volumes has a smoking picture of Monk, tea-cosy on head, I’d happily mount all three on the wall. Just to complete the asymetry – its Monk after all – Volumes 2 and 3 are from the same evening concert in Paris while volume 1 is from Italy. And to the annoyance of all, according to those in the know, the best live concerts in his First European tour were those recorded in Stockholm, none of which material is released here. And Live at the IT club on the Evil Silver Disk I know is better still. Nevertheless, got to love those covers and UK mono Riverside Philips Dutch press sounds pretty good (to me). Fontana/Interdisk, pressed by Philips, Holland. 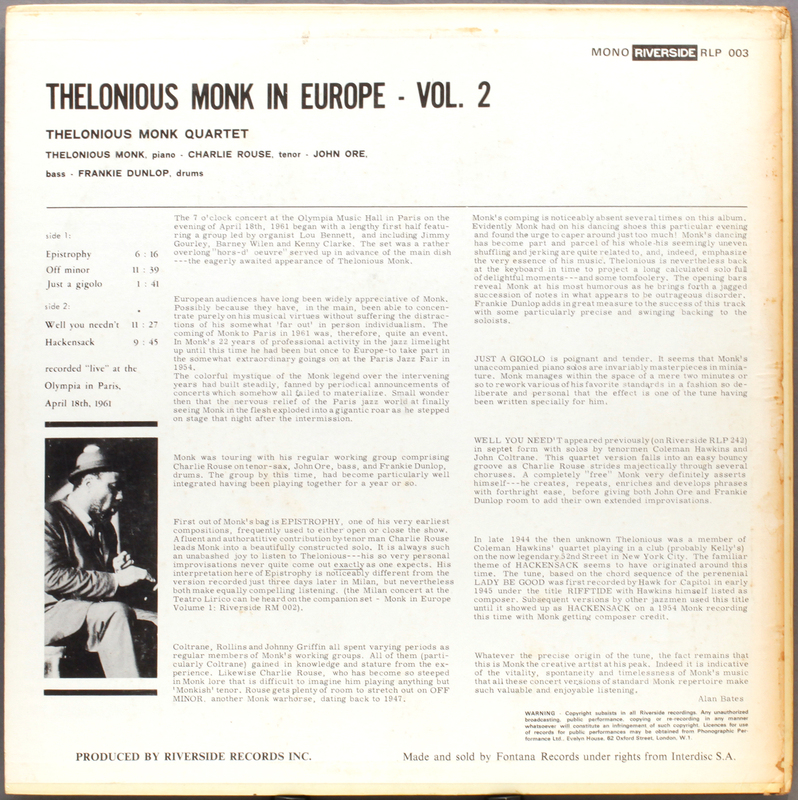 THELONIOUS MONK IN EUROPE VOL.2 RIVERSIDE MONO RLP 003 1ST PRESSING 1964; VINYL IS VISUALLY EXCELLENT; VINYL IS AURALLY EXCELLENT (WITH NO CLICKS, TICKS OR POPS); LABELS ARE EXCELLENT; COVER IS EXCELLENT: HAS CORNER BUMPING . BACK COVER HAS CORNER BUMPING, SLIGHT FOXING, LIGHT RINGWEAR AND SLIGHT MARKING UPPER-CENTRE (SEE PHOTOGRAPHS). 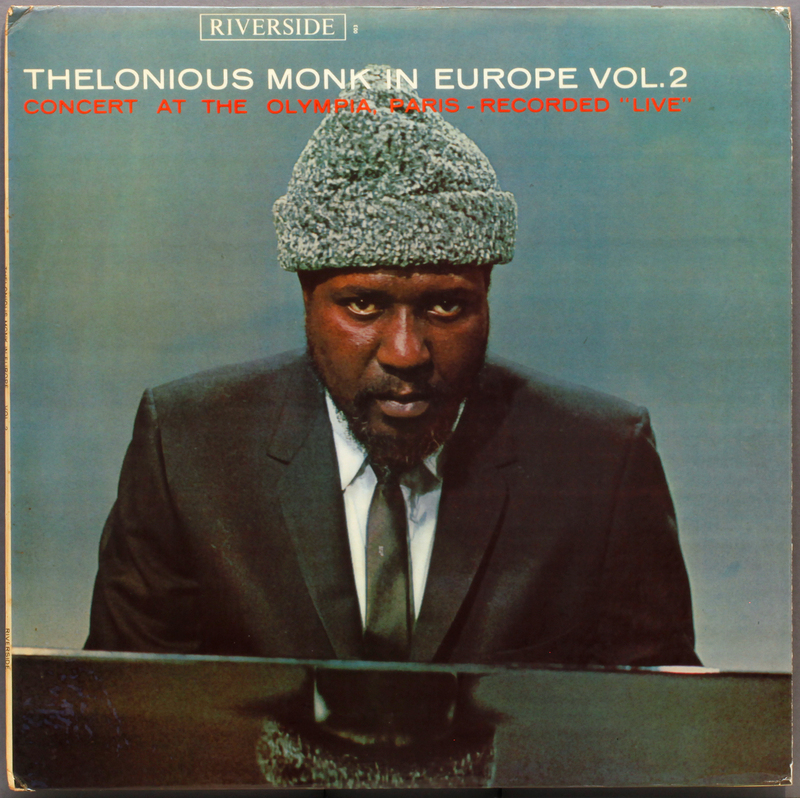 This entry was posted in Riverside, Thelonius Monk and tagged Charlie Rouse, Frankie Dunlop, John Ore, Riverside, Thelonious Monk by LondonJazzCollector. Bookmark the permalink. Not to rehash a stereo vs mono debate, but I have to say that it’s uncanny to experience this mono rip of Hackensack when you, just like me now, sit right in front of the two speakers positioned to the left and right of my computer screen and play it loudly: I’d swear there’s a certain stereo ‘feel’ to it. I can’t explain it. A mono record will always sound different whether you play it straight on a stereo system or with the “mono” switch on. The reason is that the surface noise is in “stereo” because it’s never the same in both channels. You can even increase this effect by pushing the “3D” switch that you find on some amps, but I’m afraid you will not like the result. I am not sure if this completely answers your question, because mono recordings sometimes underwent some strange processing in the early sixties. Still, I do not think that any “re-channelling for stereo” hocus-pocus was applied here. Hi Matty, I think there’s something to it. I listened to LJC’s rip again with a headphone, pressing the “3D” switch intermittently, and the difference was remarkable. The “enhancement” (well, let’s call it that…) wouldn’t work if there wasn’t anything there to be enhanced. It never works with a genuine mono recording anyway. Whatever the tampering was, they did tamper with the original tapes in some way or other. There is something in this – I am convinced not all mono sounds the same. Some exhibits a narrow point-source between the speakers, some is spread like a solid wall of sound between the speakers, some sounds spookily directional as though it has a stereo dimension. And it has “vertical stereo” due to bass cones and tweeters being three feet apart in height, even though each receives the same signal. There you have it. There’s more to mono than you’d think. This particular experience with Monk’s Hackensack as featured in today’s post had me reach for some of the mono vinyls that I have myself and indeed there something to every recording if you listen closely instead of playing them casually while you paint the ceiling. Eduard, yes I think you may be onto something. The original master for this is Stereo so the mono is not true mono but a fold down… which ranks alongside re-chanelled Stereo for audio quality in my book! The original was a USA pressing also, not UK. (By the way Matty I cant download your file, tried it several times and when I go to open it it says download incomplete….). Robert, please note what I say in the comment with the download: the ZIP file is passworded! Yes, this is a well known psychological phenomenon where you mind fills in the missing gaps in perception. A process often used by advertisers who use suggestion or inference in their advertising to persuade customers to buy products without the customer having to remember specific details. Three volumes — “a hat trick”: Jesus, I just got it. Very good, LJC, hats off to your subtlety. And on the subject of Monk, have you heard the vinyl w/Coltrane at Carnegie Hall? I bought the CD as soon as it came out and I hardly played it. In fact, I don’t think I once played it all through. It seemed congested and lack-lustre. And then a few months back I managed to find the Mosaic 200gm vinyl — a copy from the previous pressing, i.e. before it went up to nearly sixty quid (at least, I saw it on Amazon for sixty quid). It sounds utterly different — and has to be up there with the very best of live Monk, including The IT Club. It is extraordinary. One of the live Monks that makes what little hair I possess bristle with its immediacy, its refusal to vanish into the past. And Monk got a lovely piano that night. I make people work hard for the jokes around here. Damn, I passed on a copy of Monk and Coltrane just this afternoon, on the Swedish Dragon label. I have a Dragon pressing and its pretty good. I wonder if you weren’t looking over my shoulder as I just picked up a copy of the 1982 first release of the IT Club session, a double on CBS. I’m off to give it a listen. The final date in Stockholm is the one Monkologists agree was the best of the tour, as by then they had warmed up, and maybe knocked back some schnapps. It is released on vinyl only in Swedish on the Dragon label. You knew that, of course, you were just testing me, weren’t you? Tea cosy indeed. Is this the tour where Monk and Nellie were transporting empty soda bottles from country to county in their overstuffed suitcases awaiting the perfect opportunity to cash them in…? Far from financial opportunism, it’s not widely known but Mr and Mrs Monk were early advocates of glass recycling, which they discovered uses less energy than manufacturing glass from sand, lime and soda, and makes a significant contribution to reductions in CO2 emissions. Even less well known is that Monk insisted the keys of his piano were manufactured, not from ivory, but from recycled copies of the New York Times, which explains why so many of the notes were wrong a lot of the time. Yeah!!! – That’s like it oughta be. And thanks for the credits.